When you write traditional programs, you often use a compiler to convert your program from source code into object code that you can execute. When you use the dtrace command you are invoking the compiler for the D language that was used in a previous example to write the hello.d program. 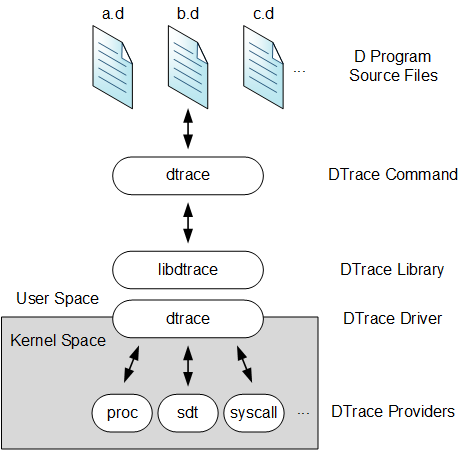 When your program is compiled, it is sent into the operating system kernel for execution by DTrace. There, the probes named in your program are enabled and the corresponding provider performs whatever instrumentation is required in order to activate them. All of the instrumentation in DTrace is completely dynamic: probes are enabled discretely only when you are using them. No instrumented code is present for inactive probes, so your system does not experience any kind of performance degradation when you are not using DTrace. After your experiment is complete and the dtrace command exits, all of the probes that you used are automatically disabled and their instrumentation is removed, returning your system to its exact original state. No effective difference exists between a system where DTrace is not active and a system where the DTrace software is not installed, other than a few megabytes of disk space that is required for type information and for DTrace itself. The instrumentation for each probe is performed dynamically on the live, running operating system or on user processes that you select. The system is not quiesced or paused in any way and instrumentation code is added only for the probes that you enable. As a result, the probe effect of using DTrace is limited to exactly what you direct DTrace to do: no extraneous data is traced and no one, big “tracing switch” is turned on in the system. All of the DTrace instrumentation is designed to be as efficient as possible. These features enable you to use DTrace in production to solve real problems in real time. The DTrace framework also provides support for an arbitrary number of virtual clients. You can run as many simultaneous DTrace experiments and commands as you like, limited only by your system's memory capacity. The commands all operate independently using the same underlying instrumentation. This same capability also permits any number of distinct users on the system to take advantage of DTrace simultaneously: developers, administrators, and service personnel can all work together, or on distinct problems, using DTrace on the same system without interfering with one another. Unlike programs that are written in C and C++, and similar to programs that are written in the Java programming language, DTrace D programs are compiled into a safe, intermediate form that is used for execution when your probes fire. This intermediate form is validated for safety when your program is first examined by the DTrace kernel software. The DTrace execution environment also handles any runtime errors that might occur during your D program's execution, including dividing by zero, dereferencing invalid memory, and so on, and reports them to you. As a result, you can never construct an unsafe program that would cause DTrace to inadvertently damage the operating system kernel or one of the processes running on your system. These safety features enable you to use DTrace in a production environment without being concerned about crashing or corrupting your system. If you make a programming mistake, DTrace reports the error to you and disables your instrumentation, enabling you to correct the mistake and try again. The DTrace error reporting and debugging features are described later in this guide. Figure 2.1, “Overview of the DTrace Architecture and Components” shows the different components of the DTrace architecture. Now that you understand how DTrace works, let us return to the tour of the D programming language and start writing some more interesting programs.